A Missouri Congressman’s hopeful there’ll be legislation to address police response to incidents involving African Americans. 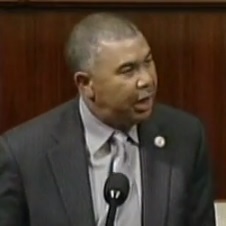 Shortly after joining the Congressional Black Caucus for a press conference yesterday, Representative Lacy Clay released a statement in which he urged Republican House Speaker Paul Ryan to act on criminal justice reform. Clay says five Republicans, appointed by Ryan, are meeting with five African American lawmakers to review recommendations by President Obama’s Task Force on 21st Century Policing. Clay’s introduced legislation to require an independent prosecutor in all cases where police use deadly force. The bill would also offer financial support for police departments to purchase and maintain body cameras for all officers. Clay’s asking for the measure to be debated and passed, and he’s urging Ryan to act on “criminal justice reform” before the end of the year. The officer involved in the Tulsa incident has been charged with manslaughter. In Charlotte, the city’s police chief says the video of the shooting there doesn’t definitively show the victim pointing a gun. He said he had no plans to release the video to the public, but does intend to show it to the victim’s family. During protests in the aftermath of the Charlotte police shooting, a person was shot and gravely injured in what police say involved only civilians. An officer was also injured during those protests on Tuesday.